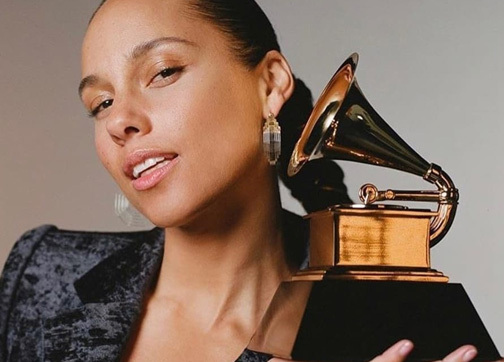 The Recording Academy™ and CBS have announced that 15-time GRAMMY® Award winner Alicia Keys will host the 61st Annual GRAMMY Awards®, marking her first time as master of ceremonies for Music's Biggest Night®. Taking place at STAPLES Center in Los Angeles, the GRAMMY Awards will be broadcast live via satellite at 9:00 a.m. tomorrow, Feb. 11 (Manila time), on JackTV and ETC, with a primetime encore telecast at 7:00 p.m. on JackTV and 8:00 p.m. on ETC the same day. "I know what it feels like to be on that stage, and I’m going to bring that vibe and energy," said Keys. "I'm so excited to be the master of ceremonies on the biggest night in music and celebrate the creativity, power and, magic. I'm especially excited for all the incredible women nominated this year! It's going "UP" on Feb. 10!" 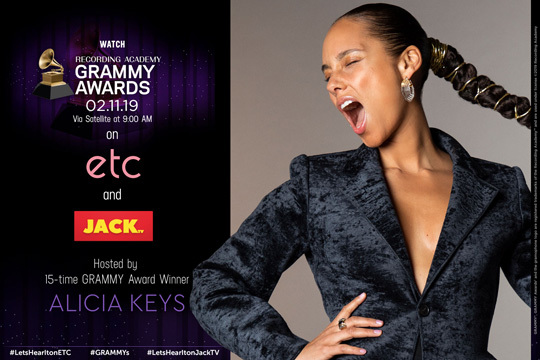 "A dynamic artist with the rare combination of groundbreaking talent and passion for her craft, Alicia Keys is the perfect choice as host for our show," said Neil Portnow, President/CEO of the Recording Academy. "Throughout her exciting career, I have watched her become a powerful force within the music industry and beyond. As an artist who speaks to the power of music, we are thrilled to have her on board for what's sure to be an unforgettable GRAMMY Awards." Keys is a modern-day Renaissance woman—a 15-time GRAMMY Award-winning singer/songwriter/musician/producer, an accomplished actress, a New York Times best-selling author, a film/ television and Broadway producer, an entrepreneur, and a powerful force in the world of activism. Since the release of her monumental 2001 debut album, Songs In A Minor, Keys has sold more than 30 million records and built an unparalleled repertoire of hits and accomplishments. In what is sure to be an unforgettable GRAMMY® moment GRAMMY winners Red Hot Chili Peppers will join Post Malone. Music's Biggest Night® will also feature the incredible talents of current multi-GRAMMY nominee Brandi Carlile, past GRAMMY nominee Miley Cyrus, and current multi-GRAMMY nominee H.E.R. They join previously announced performers and current nominees Camila Cabello, Cardi B, Dan + Shay, Malone, Shawn Mendes, Janelle Monáe, and Kacey Musgraves. K-Pop boyband BTS will also appear as a presenter during the show. For more details kindly visit JackTV on jacktv.ph and don’t forget to like us on Facebook at @solar.jacktv, follow us on Twitter @JACKTV and on Instagram @JACKTVNETWORK to get the latest updates on your favorite shows, promos, and upcoming events! JackTV is seen on SKYcable Ch. 51, Cignal Ch. 126, Cablelink Ch. 36, GSAT Ch. 61 and EasyTV Ch. 2. Stay updated, follow ETC via www.facebook.com/etctv, Twitter and Instagram @etc_channel, and log on to etc.com.ph. Tune in to ETC on UHF Ch. 21, Sky Cable Ch. 16, Destiny Digital Ch. 16, Global Destiny Ch. 28, Cignal Ch. 9, Cablelink Ch. 34, or EasyTV Ch. 1.